These push pins are ideal for hanging memos, graphs, charts, and other items on bulletin and notice boards in your classroom. They come in assorted colors (red, white, blue, yellow, and green) and have 3/8" points. 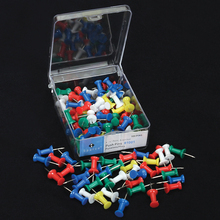 Designed for use on bulletin and notice boards, these push pins are ideal for hanging memos, graphs, charts, and other items in your classroom. They have 3/8" points and come in assorted colors (red, white, blue, yellow, and green). Box of 100.